For those who are driving down from Kuala Lumpur, Johor Bahru, Singapore, and other places on main land, you may choose the nearest Jetty Terminal. There are signboards indicating the junctions to get off the highway, after reaching Kedah, look for the sign " Alor Setar Selatan" and "Langkawi". The journey from Kuala Lumpur to Kuala Kedah takes about 6 hours while Kuala Perlis is another one hour away. There are four departure points for visitors who opt to travel by boat or ferry to Langkawi and they must make their way to Kuala Perlis in Perlis, Kuala Kedah in Kedah, Georgetown on Penang island while tourists who are in Thailand will depart from Satun. 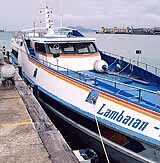 Most operate from 8.00 a.m. until 6.00 p.m.
From the jetty at Kuala Kedah, there are about five companies that provide ferry service to the island (trip time: about 1 hour and 45 minutes; cost: RM15,00). Ferries let you off at the main ferry terminal in Kuah, where you can take a taxi to your resort for between RM30,00 and RM40,00 . If you're coming from Penang, the ferry is the way to go. Bahagia Express has a morning and afternoon speedboat from Weld Quay in Georgetown for RM35,00. Call them in Penang at tel. 04/263-1943 or visit their office across from the clock tower, just next to the main tourism board office. If you're heading from Langkawi to Penang, you can call Bahagia in Langkawi at tel. 04/966-5784. When you go to the Langkawi you can better ask for a ticket in the star class. 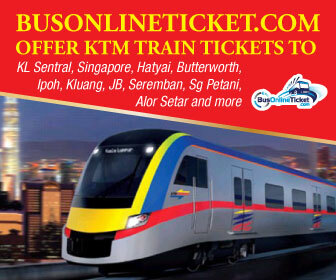 It will cost you RM 25,- for a one way ticket, but it's much better. 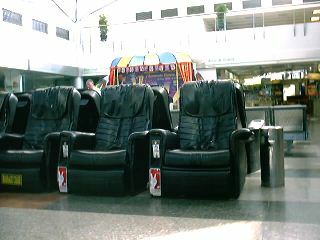 You got a very quiet deck with excellent chairs. That was the the first time we didn't get sick.